Habit: Annual 1--2(3) dm. Stem: 0.1--0.5 dm, tomentose. Leaf: basal and cauline; blades 0.5--3(4) cm, 0.3--1.5(2) cm wide, generally tomentose. Inflorescence: 5--25 cm, 10--30 cm wide; branches tomentose; peduncles spreading, (0.5)1--3 cm, straight or +- so, thread-like, glandular-hairy; involucres 1--1.5(2) mm, 1.5--3(3.5) mm wide, glandular-hairy. Flower: 1--2.5 mm, glandular-hairy; perianth white to yellow, pink or red, with a rose-purple spot, outer lobes elliptic to +- round, inflated base to middle, inner lanceolate. Fruit: 1--1.5 mm, glabrous. Chromosomes: n=20. Synonyms: Eriogonum angulosum Benth. var. flabellatum Gand. ; Eriogonum angulosum subsp. maculatum (A. Heller) S. Stokes; Eriogonum angulosum var. maculatum (A. Heller) Jeps. ; Eriogonum angulosum var. patens Gand. ; Eriogonum angulosum var. pauciflorum Gand. ; Eriogonum angulosum var. rectipes Gand. ; Eriogonum cernuum Nutt. subsp. acutangulum (Gand.) S. Stokes; Eriogonum thurberi Torr. var. acutangulum Gand. 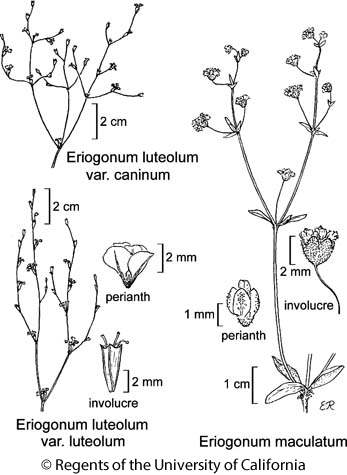 Citation for this treatment: James L. Reveal & Thomas J. Rosatti 2012, Eriogonum maculatum, in Jepson Flora Project (eds.) Jepson eFlora, http://ucjeps.berkeley.edu/eflora/eflora_display.php?tid=24860, accessed on April 24, 2019.
s SN, TR, GB, D; Markers link to CCH specimen records. Yellow markers indicate records that may provide evidence for eFlora range revision or may have georeferencing or identification issues. Purple markers indicate specimens collected from a garden, greenhouse, or other non-wild location.